From being termed as ‘hit-and-giggle’ cricket to becoming the most lucrative form of the sport, T20s have wrought many changes in the cricketing world since its inception a decade ago. The injection of substantial sums of money and increased viewer-ship following the advent of T20s has caused national teams around the world to take the newest form of the game more seriously, and as Jeeshan argues, this increased professionalization and specialization in many of the top tier cricket nations has left teams like Bangladesh in its wake. This article explores the yawning gap that has come to exist between Bangladesh and other Full Members of the ICC and posits some of the methods and tactics that may be implemented to address it. In 2002, the ECB decided it needed to take drastic measures to boost the popularity of cricket. The game was becoming unpopular amongst the younger generation, crowds at the grounds were dwindling and organizers were losing sponsorship. The ECB’s drastic measure was a fast paced, exciting, shorter version of cricket called T20. Slowly, T20 fever started spreading and soon other countries started replicating this format in their countries. The first major international T20 tournament was the ICC World Twenty20, held in South Africa in September 2007. While T20 was reviving the game in a commercial sense, there were plenty of skeptics who argued it would ruin the game - in both sporting and non-sporting terms. The 2007 ICC World T20 in South Africa seemed to work in the favor of those who supported T20. On the 13th of September, Bangladesh and Zimbabwe pulled off two upsets by beating the West Indies and Australia respectively. Two years later in the 2009 version at England, Ireland stung Bangladesh while the Netherlands overcame hosts England in a last ball thriller. At this stage the general belief was T20 would encourage more global participation through the involvement of more associate countries. There was also a belief that the shorter version would reduce the gap between the stronger and the weaker teams, stirring up greater competition like that regularly happens football's FIFA World Cup. But as the T20 game developed, year by year, the opposite started to happen. The strong became stronger and the gap widened. The 2012 ICC T20 in Sri Lanka was proof, as Afghanistan, Ireland, Zimbabwe and Bangladesh were demolished by their more illustrious opposition. When T20 was first introduced, weaker teams could put up a fight, as the more established teams were also adapting to the game. But with time these stronger teams adapted, became more specialized and the gap widened. One pervasive trend in T20 is the tendency of fielding specialized T20 teams which have different players and even coaching personnel. Many of the top teams have separate captains for their T20 teams. These teams also have players who are only chosen for the T20 format. Australia’s snubbing of the highly talented Nathan Lyon for a 42 year old Brad Hogg in the T20 2012 World Cup is one of the more striking examples. Players like Hogg play T20 tournaments around the world and have developed specific competencies and skills suitable for T20. Recently, England and South Africa have even gone to the extent of appointing a specialist T20 head coach. While Gary Kirsten is accountable for the South African national team, Russel Domingo will manage the day-to-day activities of the T20 team. Similarly, Ashley Giles has been recently given responsibility over England’s limited overs teams. Bangladesh in contrast wouldn’t mind fielding a similar team for Test, ODIs and T20’s. Our selectors probably haven’t realized that T20 has developed in such a way it that it requires a different set of skills and mindset. Their selection of Ziaur Rahman is laudable but the trick is to find more Ziaur Rahmans. They need to find batsmen who are capable of scoring from boundaries. Similarly, they need to look for bowlers who bowl better under pressure and have more in their repertoire beyond wicket-to-wicket deliveries. A lot of commentators love to watch Bangladesh bat, branding our batsmen as exciting stroke makers. Indeed, the likes of Tamim, Ashraful and Shakib love to attack and take the bowlers on. But there is a big difference between stroke makers and big hitters! Ask Nasir, Mushfiq and Riyad. In the 2012 ICC World T20 all three hit reasonably well timed shots with all their might. Unfortunately, they were caught just a few feet inside the boundary rope. Now, in comparison, even if Nasir Jamshed or Brendon McCullum or Marlon Samuels mistimes the ball, it is still likely to fly over the rope for six. 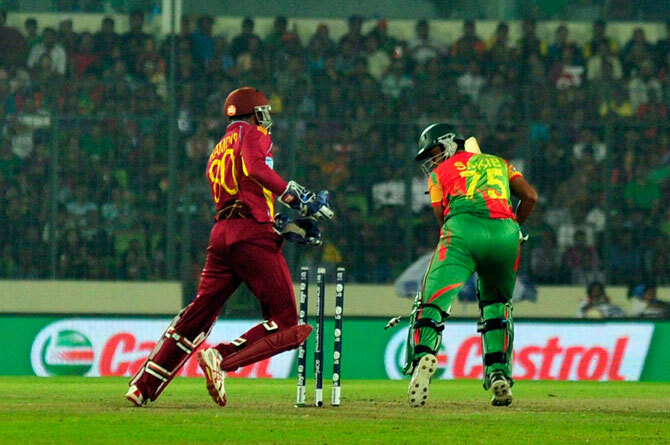 While Shakib and Tamim hit with all their might to get 4’s and 6’s, players like Jamshed and McCullum do it with ease. So, note the difference between big hitting and stroke making. Our batsmen can only do damage when the field is up but beyond that they find it very difficult to clear the fence or target the gaps. Big hitters can roughly be categorized into three groups. The first group consists of guys with big, broad shoulders, strong chest and arms. These guys rely purely on brute strength, power and balance. Gayle, Richard Levi, Afridi, Jayasuriya, Samuels, Pollard are examples of this category. Such batsmen need not be technically very proficient. This is why you will see a lot of Afghan, Zimbabwean and associate level players hit 100m sixes with ease. They might not have the best technique but they have the power and muscle to clear the fence. This works in T20! Now in Bangladesh only Ziaur Rahman,and Mashrafee would probably qualify under this category. The second group consists of batsmen who might not exactly have strong physiques, but are blessed with outstanding technique and timing. They have the ability to make that sweet connection which takes the ball effortlessly to the boundary. They also possess a wide range of shots which allow them to hit all over the ground. A glimpse at their wagon wheel will show lines reaching every corner of the oval. Most of the Indian batsmen fall in this category. In Sri Lanka, guys like Mahela, Dilshan and Sangakarra are examples. In his best days, Ashraful could do this (remember the sixes against Anderson and Harmison?). Tamim, Shakib, and Mushfiq can also do this but not as consistently. The third group are those rare batsmen who can do both. Sehwag, Yuvraj Singh, Watson and Kallis are four modern day examples of this. They are not only strong, but they also have outstanding technique and timing. They combine these two facets of their game to hit fours and sixes with ease. Now analyze our batsmen: do they fall into any of the big hitter categories? Most of the players not mentioned above are very inconsistent when it comes to big hitting. They will depend on a poor delivery, poor field placement or poor fielding or external factors such as a small ground to hit boundaries. But here is the thing: nowadays developed T20 teams will not give such opportunities, which means it is up to our players to hit a good ball for a four or six. Only Tamim and Shakib can hit perfectly good balls for boundaries but even they have their limitations, which brings us to the next point. If you are bowling to Shakib Al Hasan in the slog overs where and how would you bowl? Chances are, 7 out of 10 times, he will try to slog you over deep mid wicket. Your best bet would be to place your best catcher in deep midwicket, then bowl slightly short, slightly wide of off-stump. He might clear the fence once in a while, but a slight mishit will be enough to get you a wicket. Mushfiq, Nasir, Mahmudullah and most of our other batsmen have the same problem. Their wagon wheel will show their affinity for playing through midwicket for boundaries. The best T20 batsmen are capable of hitting all over the ground. Let us not talk about the Indian or Pakistani batsmen, because they are so technically gifted. Think about Mahela and Sangakkara and many of the Sri Lankan batsmen. How are they so good in T20’s, how can they hit boundaries with such ease? It is not as if they are bigger and stronger than our guys. Yes, they are very technically sound, but they are also capable of hitting all around the ground. They don’t blindly target midwicket every ball. They hit based on the merit of the ball and into the available gaps. If Shakib is capable of perfecting his inside-out shot and hitting over bowlers' heads, then he will have not one, but three good weapons to extract boundaries. The same applies to all our other batsmen; they need to increase their range of shots, which not only gives them more avenues to hit boundaries but will also make the bowler think and take chances. Expansive batting also means the ability to play clever i.e. innovative shots. This brings us to the next point: mystery. Big hitting is not the only way to get boundaries. Ask Brendon McCullum! McCullum is the Tendulkar of T20 cricket. Alongside Gayle, McCullum is probably the most dangerous T20 batsmen in the world. But unlike Gayle, who relies on power and conventional hitting, McCullum can be more difficult to bowl to because of his crafty, inventive batting. McCullum has perfected a lot of unorthodox strokes like the reverse sweep, scoop, dabs, late cuts and so on, which adds this aura of mystery around him. You never know how to bowl to him. A bowler might wonder “if I keep it straight he will hit me over long on for a six. If I bowl a slower one he might find some way to sweep or scoop me for a boundary.” Now do you think any of our batsmen gives bowlers a lot to think like this? Probably not. If you are bowling against Bangladesh all you need to do is to setup a deep midwicket trap. Mystery is even more important in bowling. Look at the highest ranked bowlers in T20. Eight of the top ten bowlers are spinners and most of them have some element of mystery in their bowling. Why are Mendis or Narine or Botha or Nathan McCullum so effective in T20 but not so great in other formats? In T20 batsmen don’t have the time to think or to read the bowlers action, grip, etc. They have to go for it from ball one. In other formats you have a bit of time to figure out the bowler. And when under pressure to hit every ball, it becomes an issue when they don’t know which way the ball will turn or what it will do. The result? Lots of wickets! Even conventional bowlers have adapted their game for this version. Records suggest Razzak and Shakib are better slow left arm bowlers than Rangana Herath. But be unbiased and think about the one spinner you would select from Razzak, Shakab and Herath for your T20 dream team? If Herath is your choice, you have a better chance of success against most teams on most surfaces. Shakib and Razzak have only two deliveries: the orthodox turning delivery and the arm ball. Since they are wary of giving the ball air, they mostly resort to darting it into the pads and the arm ball. This makes them very predictable and allows batsmen to play premeditated slogs all around the ground. This predictability is a reason why Shakib and Razzak have been struggling in T20’s in recent times. Now, in contrast, Herath has the orthodox delivery, the arm ball, the one that goes the other way, the carom ball. In fact Herath is one of the few SLA’s in world cricket who has the left armer's doosra. Herath also varies his pace, uses the bowling crease and is not afraid to give the ball plenty of air and as a result extracts good turn. All this keeps the batsman guessing and wondering what he can expect next. Not an easy task when the batsman has so little time to get his eye in and start hitting. This is the same reason why guys like Narine, Mendis, McCullum, Ajmal have a lot of success in this format. Even a pace bowler needs to do more than bowling wicket to wicket. Low full tosses, yorkers, slower deliveries, slower bouncers, perfectly practiced bouncers (which presents a dot ball opportunity)- unless a pacer can add these to his armory he becomes very predictable and easy to score from. Mystery also applies to captaincy. As a David, Mushfiq’s best bet to beat the Goliaths of T20 cricket would be to always do things differently - surprise batting order changes, changing bowlers every over, bowling spinners in death/opening over’s, unorthodox field placements- anything to unsettle or surprise the opposition. Unfortunately our team management and captain often resorts to traditional or conventional thinking which makes us sitting ducks. How many times have we lost a match from a good position because of poor bowling, poor captaincy or reckless batting in crunch situations? Remember Mashrafee’s 17 runs in the last over to gift Zimbabwe a shock win or Shahadat's reckless bowling in the Asia Cup 2012 in the death overs? Or even Rubel's 29 runs against West Indies in a recent T20 when we were in a competitive position? These things just keep on happening because of our inability to play under pressure. How does Ireland beat us so frequently? It is not that they are better than us skill-wise, they are just better playing under pressure. Why are we so inept in high-pressure situations? It would probably be a good topic for a psychology major's research paper. Whatever the reasons, this continues to be our Achilles heel. Compared to an ODI match, the pressure in a T20 match is 2.5 to 3 times more. One mistake can have a spillover effect: a careless shot can lead to a mini-collapse. A dropped catch can totally change the course of the match. Remember Abul Hasan dropping Imran Nazir in the recently held T20 WC? Dropped at 1, Imran Nazir went on to score 72 runs from 36 balls so as to totally change the game. It would be wrong to pit the blame on young Abul Hasan. Rather selectors should be held accountable for picking a player who hadn't even played 5 FC matches before that match. Bangladesh will always struggle in pressure situations unless we discover eleven Shakibs. Like it or not, it is just not in our DNA. The least the selectors could do is opt for more experienced players, who have seen similar situations, who have played against similar opponents in similar tournaments. Tomorrow they will pick another new Abul Hasan and another one the day after. Our selectors must refrain from blooding inexperienced youngsters in such high-pressure games. If this continues, we'll keep losing matches because of dropped catches, misfields, loose shots, pointless runouts etc. How can we make progress in T20 cricket? As it stands the gap is widening with the top teams and very soon associate teams beating us will no longer be considered upsets. Our future prospects in T20 could lie in the hands of three sets of people. The Selectors- First and foremost the selectors must start developing players for each format. Just because someone does well in Tests or in an ODI match, shouldn’t qualify him for a spot in the T20 team. We need more Ziaur Rahmans in our T20 teams. By Ziaur Rahman I don’t mean big-hitting all-rounders, rather players who have a lot more to offer in the shorter format. We also must not treat T20 lightly and use it as an opportunity to test youngsters, particularly in important tournaments like the World T20. T20 is probably more difficult for youngsters than ODI. Anyone who has to play in this format must be able to handle the extra pressure, whether with the bat, ball or in the field. So if we expect Abul Hasan to do well against Marlon Samuels or Anamul Haque to score against Malinga or an Ajmal, we will always end up disappointed. The Players- The job of a coach is to mentor a player, help him improve, learn new techniques and so on. But whether a player develops or not, ultimately depends on his own perseverance, sincerity and hard work. A player must be willing to learn, willing to change, willing to try out new things and go on the journey of continuous learning and improvement. In Bangladesh, it often seems players leave it entirely to their coaches to do the job for them. It is as if players get together a couple of weeks before a tour, practice hard, and play the matches and then go into hiatus all over again. We rarely see players trying new things or trying hard to improve and get better. Shakib Al Hasan might be a world-class cricketer but his casual approach in training has often been questioned. Perhaps this is why he hasn’t developed his bowling much. Rangana Herath hasn’t been taught to bowl the left armer's doosra or carrom ball. He has picked it up himself through experimentation and countless hours of practice. Anyone remember Ian Harvey? In the era where Australia had McGrath, Bichel, Lee, Fleming, Bracken, Gillespie, Clark and Tait, it was hard for a medium pacer like Ian Harvey to break into the Australian side, despite having decent batting skills. So what did he do? He put in a lot effort in the nets to develop a bag of tricks which included cutters, his famed slower deliveries, slower bouncers, a quicker delivery and accurate yorkers. Because of these variations he managed to convince Steve Waugh that he was the best death-over bowler in the world and was able to break into the ODI team. Our bowlers are by no means less intelligent or less talented than Harvey, they just need to have the intent. Contrary to popular belief, T20 actually requires a lot of skill for players to be successful-it is not 'school boy' cricket. In an interview Ian Harvey said if he could he would bowl six different deliveries in an over to outfox a batsman. This is the way to play in T20, whether with the ball or bat. Players with the best repertoire of skills will always be successful. The Administrators- During the first edition of BPL there was a belief our players would develop significantly, rubbing shoulders with superstars of the game. In my opinion, we have taken this concept of developing by rubbing shoulders a bit too far. True, youngsters will pick up tricks from their more experienced counterparts in the nets and in the locker room. But, ultimately, the real development takes place in the middle of the ground, in front of a capacity crowd, in a pressure situation, with the eyes of an entire nation on the player. If the first idea was true, Shakib and Tamim would have improved significantly, having played under high profile coaches and with the biggest names in cricket in the IPL etc. But I bet Shakib has learnt more from his first BPL experience than in his IPL stints. The BPL could well be our 80-20 solution to T20 cricket development. By far the most popular cricketing tournament in the domestic circuit, BPL provides Bangladeshi players a terrific opportunity to learn and establish their credentials. However, here comes a dilemma. Giving a platform for local players to hone their skills, a tournament to identify talent. If their objective is the first one, then they are on the right track. If their objective is the second one, then they have a lot of work to do. The second objective requires maximizing opportunity for Bangladeshi players-this could mean having a Bangladeshi captain for each team, encouraging them to test their decision making (instead of a foreign superstar trying to call the shots), it could mean allowing the better local batsman to bat higher up the order, it could mean allowing our better fielders to field in the critical positions, it could mean allowing the local bowlers to bowl the important overs. This could ruin the entertainment factor or ruin a team’s chances of winning a match but in the long term it will be extremely beneficial for our cricket. Five foreign cricketers a team will mean that there will be 2-3 Bangladeshis just making up the numbers. Players like Azhar Mahmood will probably open the bowling and bat one down and field at backward point. All this doesn’t help us improve our game in any way. BPL will not just help us in T20 but our overall development in cricket. BCB needs to decide how it wishes to use this tournament or else the BPL will end up being a feeder for other countries, helping them develop their emerging talents such as Ahmad Shazad, Nasir Jamshed, and Andre Russell. This page has been viewed 3157 times.